Michelle Parker, age 33 and the mother of three children, went missing on Thursday, November 17, 2011, in Orlando, FL after dropping off her two youngest children (twins) with their father, Dale Smith, Jr., in southeast Orlando, FL. Michelle went missing just after her appearance on the television show "The People's Court" was aired. She and Dale Smith, Jr., who lived together at times, appeared on The People's Court in regard to a controversy over an engagement ring valued at approximately $5,000. After extensive searches by Orlando and area FL law enforcement, friends and family, Michelle Parker is still missing. Michelle's SUV - Hummer was found in an apartment complex parking lot on Friday, November 18, 2011. In late November, 2011, Michelle's cell phone was found, by divers, at the bottom of a lake in Belle Isle. 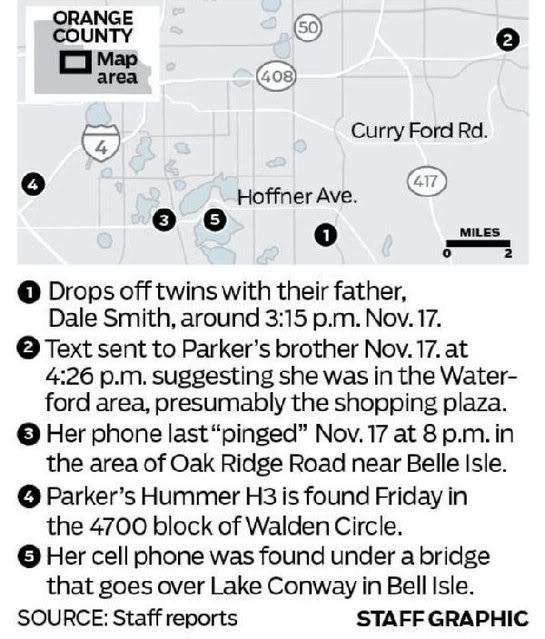 The location of where her cell phone was found is about halfway between Dale Smith, Jr.'s condominium and his parent's home, where he claimed to go after Parker dropped off their children on November 17, 2011. There have been many hours spent on this case by numerous former Hinky Meter members. There was a tremendous amount of research done on this case, by them, including search records of Dale Smith, Jr. and his father, Dale Smith, Sr. There were many hours spent on screen shots and developing graphs, diagrams, charts, etc. regarding various locations and distances from various areas. There was documentation of the various Hearings regarding the child custody issues about the twins as well as the arrest of Dale Smith, Sr. on unrelated charges. NOTICE: You are welcomed to post previous articles, any charts, diagrams, etc. that you worked so hard on and whatever you feel will bring this thread up to speed. I know it would be a monumental task to try to re-create your hard work from THM but you are welcomed to post whatever you feel you need for this thread to be an easy reference thread if there is further development in this case. I will post a few articles to get this thread started. Date of articles are not usually colored in red but I will color the date of the older articles to draw attention that these are older articles. This is a Michelle Parker "Missing Person" poster that was released shortly after she went missing. Since it was released, the reward changed many times. If there is any inaccurate info in this article, please PM me as soon as possible. Thank you! Parker has never been in trouble with the law, but WFTV learned that she's had to call for help. (CBS/AP) ORLANDO, Fla. - The search for missing Florida mother Michelle Parker, who disappeared last month just after her appearance on the television show "The People's Court" was aired, has moved to another central Florida city. she appears on syndicated court room reality show "The People's Court." The family of missing mother Michelle Parker will be allowed to visit with her two youngest children often now that a visitation agreement has been reached. Yvonne Stewart, Parker's mother, was able to spend Sunday with her 3-year-old twin grandchildren, according to her lawyer Matt Morgan. "Yvonne will have very liberal access to the children," Morgan said in an email to the Orlando Sentinel. "The details of the agreement will remain confidential." Her eldest son is being cared for by his father and is not part of the visitation agreement between Stewart and the twins' father, Dale Smith II. 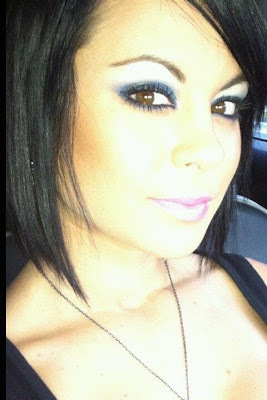 The 33-year-old mother vanished Nov. 17 after dropping off the twins with Smith at his home on S. Semoran Boulevard. Her family reported her missing after she failed to show up for work at The Barn that same evening. when she disappeared Nov. 17. ORLANDO, Fla. -- It's been six months since an Orlando mother disappeared after dropping off her children to their father, and there's still no word on what happened to her. Parker's mother is the one who seems to be in closest touch with detectives, and she said Wednesday night she got a call from an investigator who is still actively working the case. There are no solid leads yet, but the family staunchly believes the truth will come out someday. What happened to Parker remains a mystery. She was last seen Nov. 17 as she dropped off her twin 4-year-olds to their father, Dale Smith Jr.
children at the home of Dale Smith II, her ex-fiance and the children's father. Thursday marks six months since an Orlando woman disappeared after dropping off her young children with their father. Michelle Parker has been missing since November 17. But despite her picture being posted all over Florida, there has been no word on what happened to the 34-year-old mother of three. Late Wednesday, News 13 received an email from Michelle Parker's father and stepmother, saying they are frustrated, but without any physical evidence, they are holding onto hope. It's been six-months since Michelle Parker was last seen alive. The mother of three vanished after dropping off her two youngest children with their father, Dale Smith Jr., at his home in southeast Orlando on Nov. 17. The mother of a missing Florida woman who disappeared the same day her case appeared on "The People's Court" said that her daughter was "humiliated" by the show. Michelle Parker, a mother of three, was last seen Thursday afternoon when she dropped off her 3-year-old twins at her ex-fiancé Dale Smith's home. Parker also has an 11-year-old son from a previous relationship. The feuding couple appeared on "The People's Court" to resolve a dispute about the $5,000 engagement ring that Parker, 32, allegedly drunkenly threw over a hotel balcony during an argument. Parker's mother Yvonne Stewart told ABC News that when Michelle returned from taping the show in the summer, she said, "It was the most humiliating experience of my life. I don't even ever want to see it. I wish I had never gone." then mysteriously disappeared the same day. You have done a fantastic job by posting all the information about Michelle Parker Case. Thank you so much for creating this forum. I still hope that some day soon there is a resolution to this case. At least three Florida mainstream media sources did an update today and I wanted to start this thread with some basic background into the case instead of just posting the updates. I hope that some of the members will post the screen shots they did if they saved them to their computers. Some of our former THM members did an awesome job of determining distances to various locations in this case and other info. I have seen some of their work when I Google: Michelle Parker - The Hinky Meter and click on IMAGES. Jeff Stewart, left, and Yvonne Stewart, center, talk with Orlando Police Homicide detective Michael Moreschi as Orange County Sheriff Dive team search Wednesday, February 1, 2012 in a lake for clues in the missing person case of Michelle Parker. The body of water borders South Orange Blossom Trail north of Americana Blvd. Under the direction of Orlando Police,Orange County Sheriff Dive team uses sonar to search Wednesday, February 1, 2012 in a lake for clues in the missing person case of Michelle Parker. The body of water boarders South Orange Blossom Trail north of Americana Blvd. Florida Department of Law Enforcement agents have scheduled a news conference for 9:30 a.m. tomorrow morning to give an update on Michelle's case. Justice4all wrote: Florida Department of Law Enforcement agents have scheduled a news conference for 9:30 a.m. tomorrow morning to give an update on Michelle's case. You are welcome Alessandra. I hope they have made significant progress. Justice4all wrote: You are welcome Alessandra. I hope they have made significant progress. I also hope there have been some new developments. There could be a major break in the case of missing Orlando mother Michelle Parker on Thursday. WFTV found out that a group assigned to take a fresh look at the evidence in the case is expected to reveal new information that could help investigators figure out what happened to Parker, who disappeared in November. At the end of the video, the reporter said WFTV would be there for the presser at 9:30. I wonder if WFTV will stream it live. I guess it is worth checking the home page around 9:30 EDT for a Live Stream. The live stream was heartbreaking. The anguish of her mother was palpable. Her comment at the end... If no one goes to jail for this.... I just want my girl back! I truly hope that they can find Michelle and close this case! I am glad you have kept this one alive, I hope they can find this young women and bring her home to her family. The Florida Department of Law Enforcement held a joint news conference Thursday with the Orlando Police Department to announce the special team. Officials said they hope the new smart panel will help get the case moving again. "We do have a person of interest, we've had a person of interest since day one, and all we need to know is fit that missing piece to the puzzle, and I hope to fit it today," said Orlando Police Chief Paul Rooney. "I'm hoping a phone call is generated. All we're trying to do is connect the dots, and there's just a few more dots we need to connect, to resolve this." ellejay, this makes me nervous, DS2 has to know eventually he is may be arrested & it would seem his parent's don't stand a chance in hell of getting custody of the twins should that happen. imo, this led to Josh Powell murdering Braden/Charlie. That SOB preferred to murder the boy's INSTEAD of allowing them to be raised by the Coxes' should he go to jail. It's always scarey imo, for these nutjobs to get backed into a corner., they are never going to put their children first, it is always about them. Orlando, Florida - It's been an incredibly difficult journey for Yvonne Stewart. She is the mother of missing Orlando mom, Michelle Parker, who disappeared last November after an episode of The People's Court where the 34-year-old appeared during a dispute over an engagement ring. So far, the case has grown cold. Until now. There is now a "dream team" of sorts taking a second look at the case. Orlando Police call it a "fresh approach." Is there a new lead in the Michelle Parker case? Police have just announced that they are reopening the case of missing woman Michelle Parker and assigning a brand new team to find her. The mother of missing Florida woman Michelle Parker, 34, spoke out Friday about her concern for her grandchildren as a new review of the evidence pointed back to where authorities first looked — Dale Smith II, Parker’s 40-year-old ex-fiance and the father of her 4-year-old twins. Stewart does not get to see her grandchildren as often as she would like, because their custody remains with Smith, named a person of interest in the case. The twins turned 4 just a couple of days ago, and neither Stewart nor Erickson got to see them. The family does not communicate with Smith directly and instead speak to him through his lawyer. appearance on "The People's Court" aired. Last night I was searching for Hinky Meter images and found this. I was able to find where it was loaded to Photobucket. The team of more than 20 current and former law enforcement officers met last week and plans to meet again. The team was assembled by the Orlando Police Department and FDLE and included law enforcement experts from various fields, to include crime scene investigations and crime lab resources. Thanks for the post Ann. Way too many women out there hooking up with the likes of DS & with an old man like his, it's not a wonder he's a POS. Sure hope they turn up some leads soon -- I squirm when I think of him having custody of those little kids. Family members of #missingmom Michelle Parker announce new search Sunday Nov 4. Say it is based on @FBI recommendations. Alessandra_Deux - thanks for the news, I was thinking about Michelle just today. I feel so badly for her twins and family. I wonder if it is LE that is going to do the search, the search is still a month away. I am just glad searches are still being conducted and hopefully she is found. Police are asking for search volunteers. Michelle Parker's family announced they would resume a search for the missing mother-of-three based on recommendations the Federal Bureau of Investigation gave police, according to their website. The family asked for volunteers through their Facebook page for the Nov. 4 search — nearly one year to the date she dropped off her two children at the house of their father, Dale Smith Jr., before vanishing. Orlando Police said they did not order the search and would not comment on an active investigation. "We are just supporting the family," said Sgt. Vincent Ogburn, a police spokesman. The mother of missing Orlando woman Michelle Parker has started a petition to change Florida law. Parker's mother, Yvonne Stewart, worked with Rep. Darryl Rouson and attorney Matt Morgan to write up and launch the petition on Change.org. If passed, the petition could lead to the enactment of Michelle's Law, which will allow the family of a missing person to petition a court for visitation of his or her children. According to the petition's website, Stewart and her family "are lucky at this point in time that we get to see (the children), however, it would help anyone in similar circumstances and quite possibly set an example for other states to follow and change their laws." Volunteers will meet at 8 a.m. Sunday in Lake Nona. A new search for missing mother Michelle Parker is scheduled for this weekend in southeast Orlando. Volunteers interested in assisting in the search are asked to meet at 8 a.m. Sunday at the Orlando Police substation in Lake Nona at 10727 Narcoossee Road. Volunteers must sign in and will then be placed in a search group and sent to a specific search area with a team leader. Searchers will be in wooded areas and should wear jeans, closed-toed shoes and a bright colored shirt. Parker's family posted the search information on the Facebook page dedicated to finding Parker. "We are looking for Michelle....We will not stop," the message states. "This will be one of many that we hope to organize. We will not let the evil that has taken her from us, her son's and daughter win. We will search how ever long and how ever far we have to." Police urge anyone with information about the case to call Crimeline at 1-800-423-8477. About 150 people showed up Sunday to look for Michelle Parker, canvassing the Lake Nona area in a disappointing search for the missing mom. Volunteers waded through the dense woods looking for Parker, who was last seen Nov. 17, 2011, when she dropped off her twin children at their father's townhouse in Carter Glen Condominiums off Goldenrod Road. Dale Smith, 41, the twins' father, is the last person known to have seen her alive and has been named the prime suspect in the case, but he has not been charged with any crimes. Brad Parker, Michelle's father, said some bones were uncovered during Sunday's search, but he did not know if they were human or animal bones. He said they will be given to Orlando Police for further inspection. Michelle Parker was last seen Nov. 17, 2011. This weekend, her family is reflecting on the year gone by since she disappeared. I could scream that the ONLY named suspect by LE is Dale Smith 2. I could scream that Michelle's twins live w/him. Michelle Parker and her children. A new bill which stems from the case would allow the courts to grand visitation rights to grandparents in certain circumstances. ORLANDO -- A new bill in the Florida House that would give grandparents more rights in Florida is based on the Michelle Parker case. The bill is sponsored by FL Rep. Darryl Rouson, D-St.Petersburg, FL Rep. Matt Gaetz, R-Niceville and FL Rep. John Tobia R-Brevard County. The bill, HB 19, would give grandparents the right to petition the courts for visitation under certain circumstances, and also rights for great-grandparents. The bill stems from the case of missing Orlando woman Michelle Parker. She disappeared last year. Parker's children were put in the care of their father, Parker's ex-fiance Dale Smith Jr. Smith is a suspect in Parker's disappearance. Parkers' family also claims they have not been able to see the missing woman's children. Reluctantly believing she is dead, the family of Michelle Parker, the Florida mom who vanished after appearing on The People's Court in 2011, filed a wrongful death lawsuit Thursday against her ex-fiancé, Dale Smith, whom they believe was responsible. Parker's family claims Smith knows what happened on Nov. 17, 2011, the day Parker was last seen alive. "The family doesn't want to believe that Michelle is dead, but they believe that she is," their attorney, John Morgan, tells PEOPLE. "This is a case that has gone cold, so a civil case is the only way that Michelle's family will finally get answers. Given the passing of time, as well as some evidence we have discovered, we believe that Dale Smith is responsible for her death." The mother of a Florida woman who disappeared in 2011 has filed a wrongful death lawsuit against the missing woman’s ex-fiance, Fox 35 reported. Michelle Parker, 33, the mother of three, vanished on Nov. 17, 2011, the day an episode of “The People’s Court” featuring her and her former fiancé aired. 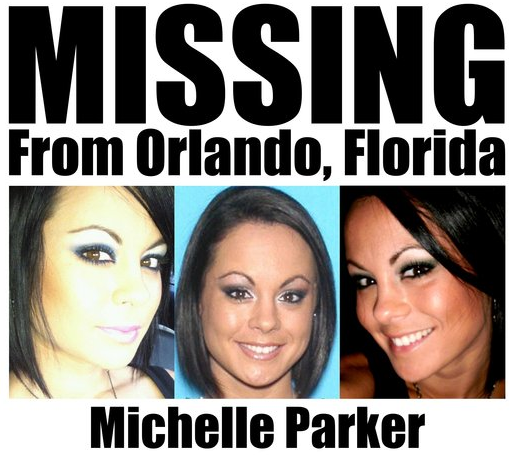 ORLANDO, Fla. —The family of missing woman Michelle Parker has filed a lawsuit against Dale Smith, the father of two of Parker's children. Parker's estate filed a wrongful death suit against Smith with the Orange County Courthouse, WESH 2 News learned Thursday. The suit accuses Smith of causing Parker's death and seeks $15,000 in damages. Smith is the only named suspect in Parker's disappearance, and according to sources, he is now living out of state with his and Parker's two children. "At the said time and place, defendant Dale Smith II, was negligent or otherwise committed a wrongful act and caused the death of Michelle L. Parker," the suit filed by attorney John B. Morgan says. Wonder why Steve Helling doesn't like John Morgan? I thought he was a reputable atty, unlike Bozo. What is wrong with Morgan? sitemama wrote: Wonder why Steve Helling doesn't like John Morgan? I thought he was a reputable atty, unlike Bozo. Sitemama, the comment was not posted by Steve Helling. TALLAHASSEE, Fla. — The mother of missing mom Michelle Parker is heading to Tallahassee in hopes of getting lawmakers to pass a bill for visitation rights for grandparents. The law would allow grandparents to petition a judge for the right to see their grandchildren. Parker's mom, Yvonne Stewart, told WFTV she hasn't seen her grandchildren in several months. Under the proposed law, grandparents would have to prove that their grandchildren are being harmed by not seeing them. Tomorrow afternoon #orlando police releasing new video evidence to mark 2nd anniversary of #missingmom Michelle Parker's disappearance. Two years after she vanished, Orlando police plan to release 'new, never disclosed video evidence' relating to the disappearance of Michelle Parker. The evidence will be released during a Monday press conference at police headquarters. In a statement, the department declined to offer any further details on the nature of that evidence. A mother of three, Parker disappeared Nov. 17, 2011 after dropping off her two youngest children with their father, Parker's ex-fiancé Dale Smith. Two years after her disappearance, Orlando police release video of Michelle Parker's Hummer stopping at a red light less than one mile from where the vehicle was later found. Orlando police on Monday released new surveillance video in the case of Michelle Parker, a mother of three who vanished two years ago just hours after she and her ex-fiance appeared in a pre-taped episode of "The People's Court." The footage shows Parker's Hummer SUV stopped at a red light at around 8:55 p.m. on Nov. 17, 2011, less than one mile away from where the vehicle was discovered the next day, according to police spokesman Sgt. Jim Young. He said authorities "don't know who was behind" the wheel at the time.